Dr. Anthony Hasan is trained in General Cosmetic Surgery and Dermatology. 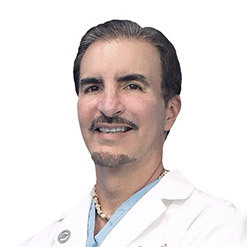 His post-graduate training ranges from General Surgery at Mount Sinai Medical Center in Miami Beach, Reconstructive surgery and Medical Care in Chronic wounds at University of Miami / JMH , Dermatology with Cutaneous Surgery also at University of Miami / JMH, and finalizing with General Cosmetic Surgery at Los Angeles California. Dr. A. Hasan was awarded and recognized as the most outstanding dermatology surgeon from his dermatology graduating class. He is also considered one of the best surgeon in the field with over 2000 TUBA successful breast implants. During his training in cosmetic plastic surgery, Dr. A. Hasan was praised and awarded for his natural artistic skills, and proficiency in cosmetic procedures. He is currently an active member of various professional and scientific societies and has published many scientific articles. He has also been televised on local and national shows such as Telemundo’s De mañanitas, Buenas Tardes Miami, and Telemundo’s Al Rojo Vivo, for his revolutionary advancements in breast Augmentation; such as the trans-umbilical breast augmentation ( TUBA). Dr Hasan major interests include the latest in general dermatology, Mohs surgery, Skin rejuvenation, breast augmentation, Liposuction, tummy tucks, facial plastic surgery, and detection and treatment of skin cancer using Mohs surgery.